I've always found herbs in desserts to be an underused combination, so I urge you to try this tart recipe. It's incredibly simple to whip up, but you can use store-bought short sweet crust pastry to make it even easier. If you can't find gloriously soft peaches, perhaps you'll have more luck with nectarines or apricots. Any stone fruit will work beautifully. 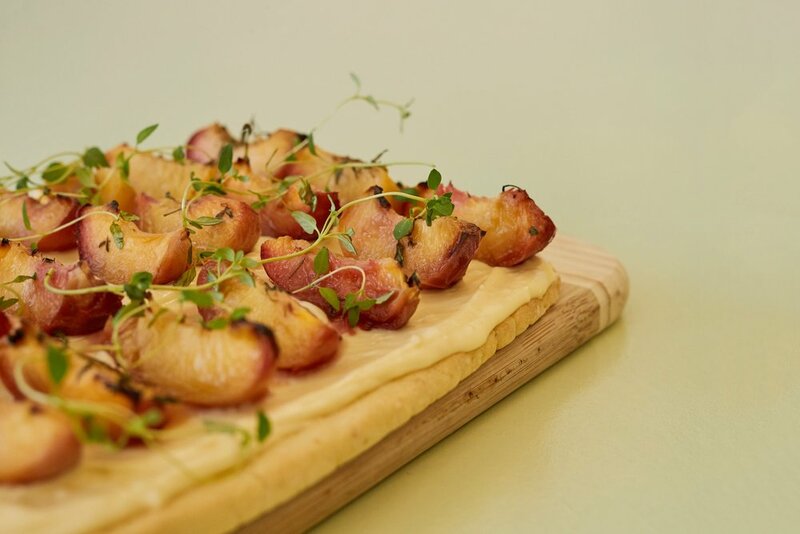 Place the peach segments on a baking tray and drizzle with honey and a few sprigs of fresh thyme. Roast them for 10-15 minutes or until caramelised and juicy. Set the peaches aside and reduce the oven temperature to 180C. Line a baking tray with baking paper. Next, make the pastry. Combine butter, icing sugar and vanilla in the bowl of a stand mixer, and cream until smooth, light and fluffy. Add salt and flour and mix until it just comes together as crumbly dough. Do not over mix. Form the dough into a ball. On a floured surface and using a floured rolling pin, roll out the ball of dough until it forms a rectangle (approximately 20cm x 25cm). It should be about ½ cm thick. Carefully transfer the sheet of pastry onto a piece of baking paper on a baking tray and make a dozen prick marks with a fork. Place in the oven and bake for 10-15 minutes, or until golden. Once baked, carefully transfer it to a cooling rack, using the baking paper to aid you. Allow it to cool completely. Meanwhile, make the filling. In a bowl, mix together the lemon curd, creme fraiche and lemon zest. Once the pastry is fully cooled, spread the creme fraiche mixture onto it. Next, place the roasted peach slices – neatly in rows or just however you like. Scatter over a few sprigs of fresh thyme.